A glimpse behind the photographs at Quillcards – cultural, historical, travel, and environmental articles with photographs. This is the interior of the Kollegienkirche, or college church, in Salzburg. 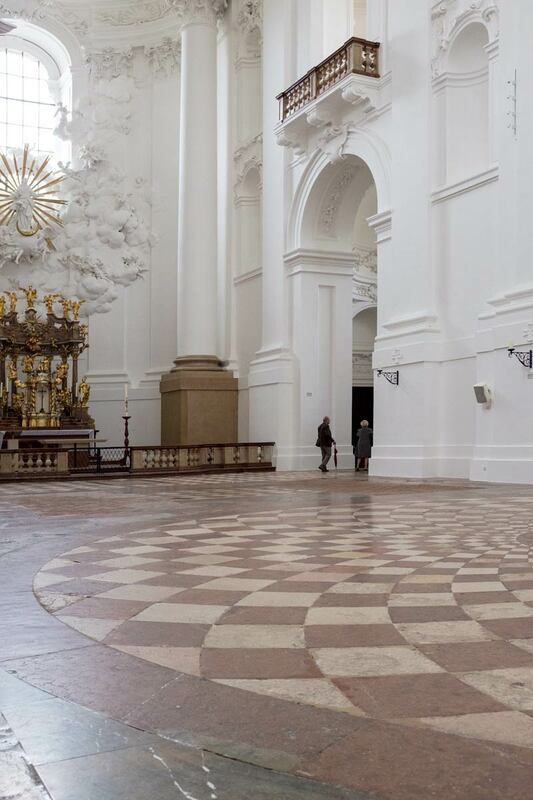 The Kollegienkirche is huge inside, so big and so empty and white that its scale confuses the eyes. The church is a UNESCO World Heritage site, and there is a placard to that effect outside. 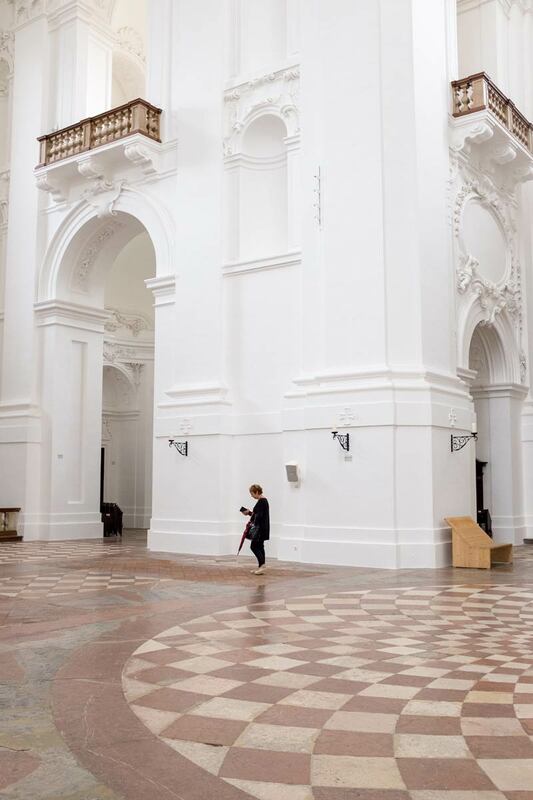 As its name indicates, the Kollegienkirche (college church) is the church of the University of Salzburg. The frothy white splodges around the window above the altar are clouds, lots of clouds. I don’t think I have ever seen sculpted clouds in a church, and it was way over the top, but pretty. It is located in a Square behind the house in which Mozart was born. Mozart was born in a house at Getreidegasse 9, and my memory may be playing tricks with me, but I recall looking out of the windows in Mozart’s house and I think I saw the dome of the church – which is what prompted me to go exploring to find it. Mozart’s house is the deep yellow house in this panorama photograph taken from the steps of the church. Mozart’s house is the one just behind the two white tent-like covers that are in front of an ice cream shop. In the nature of iPhone panoramas, the effect is to spread the view. So you have to imagine that you are looking at a Square that has been peeled back, as it were, with the sides of the Square disappearing off to the edge of the frame. I read that the church commissioned a piece by Mozart that had its premiere in the church itself in 1769. Assuming that is true, then I can imagine Mozart walking around from his house and humming the tune to himself as he made his way to the premiere. The Mozart family lived on the third floor of 9 Getreidegasse in Salzburg from 1747 to 1773. Wolfgang Amadeus Mozart was born there on 27 January 1756. So that would make Mozart thirteen years old when he composed the piece for the church.